Marriott Rewards on Tuesday updated the Terms and Conditions governing its guest loyalty program (and as always forgot to tell its members about it). The updated T&Cs gives an indication that the Lifetime Platinum Premier statuses won’t be processed in January 2019 as originally promised. This shouldn’t come as a surprise considering how badly the loyalty program integration has gone ever since August 18th. You can access Marriott’s page for Lifetime status here. The theme here is “will begin in January 2019” and takes who knows how long considering the disarray with Marriott Rewards at the moment. 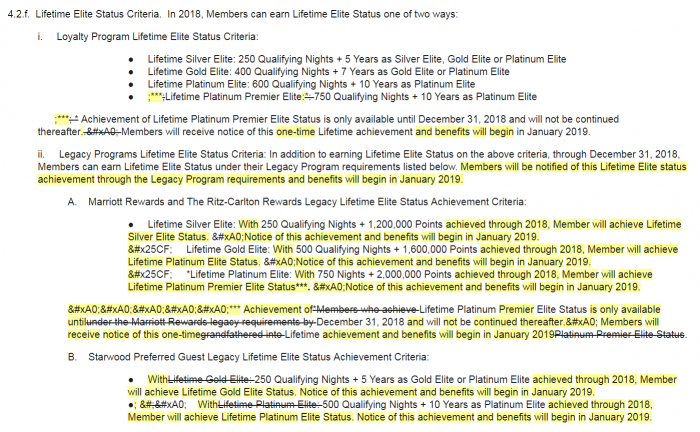 Marriott also clarifies in the T&Cs (makes crystal clear) that the legacy Marriott Rewards and SPG methods of earning the lifetime status must be achieved by the end of 2018. Seems that the Marriott Rewards anticipates here that they are not able to promptly process lifetime Platinum Platinum Premier statuses in January and this update gives them plenty of extra time.